All I wanted was a kilo of Rhubarb. It should have been an easy, and simple, just a two-sentence exchange that would leave me with a bag of bright magenta stalks to place in my bag before I headed off in search of my favorite dried figs and some oranges. But no, my "Ich möchte gern ein Kilo Rhabarber, bitte" was followed immediately by some throaty, guttural, loopy Swiss German that I could tell had nothing to do with "Yes, that will be 4 francs 80 please." As it goes with most of my attempted German conversations I had to ask, "Sprechen Sie English?" to which the response was "ein bisschen." If I didn't know any better I might assume that ein bisschen means a lot, or yes of course, or I'm fluent, or even I can talk circles around your native English, don't you even worry about it. (Don't put it past German to have one word for that). It would be sensible to think this because those two little words, ein bisschen, are frequently followed by a fluid stream of perfectly accented English, wholly obliterating the definition of ein bisschen - ein bisschen, un peu, a little, un poco. My request for rhubarb followed this all-too-familiar ein bisschen pattern as the woman went on to ask me in English if I wanted thin or thick stalks or a mix of both, and what was I planning on using the rhubarb for? Sometimes I don't even know why I attempt to speak German. Ein bisschen followed by comfortable English sets the bar too high for those of us who would like to say that we speak a little German. I can't rightly say that I speak a little German when a little has come to mean a lot. In my push to learn a lot I have started sticking post-it notes on every conceivable surface, especially in the kitchen, so that I can remember that whisk is der Schneebesen (love that one), grater is die Reibe, and measuring cup is der Messbecher. The post it notes are color coordinated; green for der (masculine) nouns, pink for die (feminine) nouns, and yellow for das (neutral) nouns. It's like Reading Rainbow in our apartment right now, just without the butterflies. Don't you go assuming that it's easy to know when a noun is feminine, masculine or neutral. It's not. Fork, spoon and knife are a great example of how muddling the German language can be. I would assume that a spoon, with all of it's gentle curves and smooth scooping abilities would be feminine, but no, it's der Löffel. And fork with it's stabbing, aggressive, sharp tongs would be masculine, but it is feminine, die Gabel, while knife with it's typically masculine -er ending is in fact neutral, das Messer. 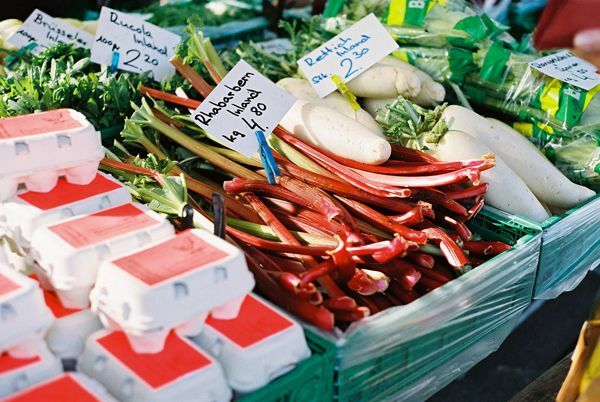 I'm willing to battle der Löffel and die Gabel because I'm eager to have a conversation in German about rhubarb and where it comes from and whether thin or thick stalks are preferable for jam, and what about for roasting with oranges and a vanilla bean? This is a good place to transition from my German rant to a melt-in-your-mouth rhubarb compote and crumbly polenta cake. Just so you know, these two go-together, don't think about making one without the other, they need each other, literally. 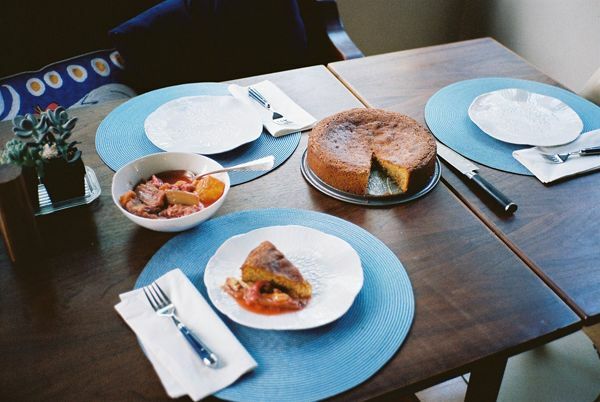 The compote is strained and the sweet, slightly tart, juice is poured over the polenta cake, augmenting the buttery almond flavor and softening the pebbly polenta to a point of desirable sogginess. I probably lost you at "sogginess," but hold tight because the soggy, crumbly, nature of this cake, is what makes it special. The texture steps softly between cake and custard, but neither one edges out the other, instead they release their competitive edge and sink into one another. This "sigh" is evidenced in the concave shape of the cake, a perfect hollow for sweet rhubarb-orange juices. The vanilla bean, which roasted along side the rhubarb and orange, adds a faint whisper to the entire concoction, nestling it's way into the crannies of the polenta cake and only grabbing your attention when you go looking for it. Each flavor adds something - a little tang, twinge or crispy sweetness - to the cake, and the cake in turn takes on all of these flavors and melds them into something new, something largely unrecognizable, but notably unique and sensational. I like to think of this as the marriage of two very talented British chefs, brought together by one very keen matchmaker. 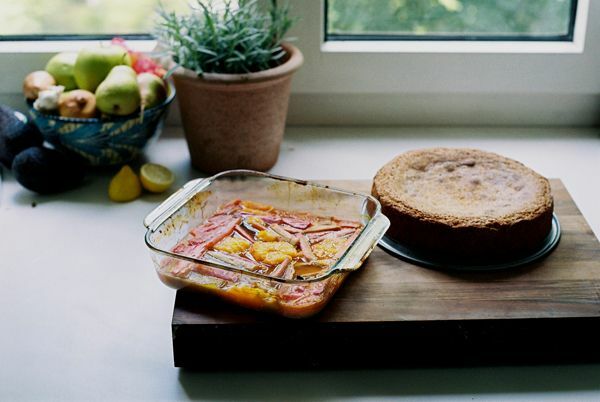 The rhubarb-orange compote comes from Nigel Slater and the polenta cake comes from Nigella Lawson, and I'll take credit as the matchmaker who helped them find ever lasting love. Nigella's polenta cake called for lemon syrup, but with all of the rhubarb season at it's peak I couldn't justify not using rhubarb to flavor the cake, so in came Nigel's perfectly tart, perfectly sweet compote. May they live happily ever after. Preheat the oven to 350ºF / 180ºC. Line a 9" spring form pan with parchment paper and grease the sides with butter. Beat the butter until light in color. Add in the sugar and continue beating until light and fluffy. 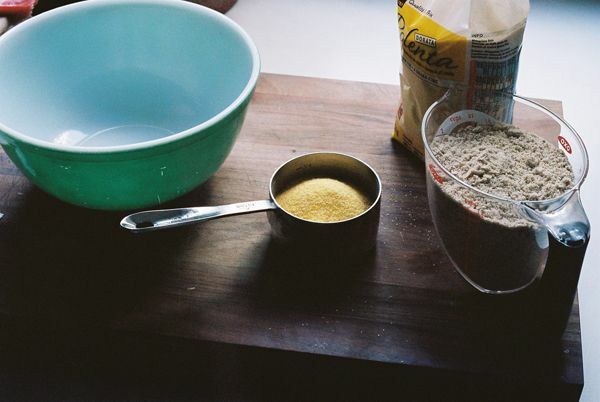 While the butter is beating mix the almond flour, polenta, and baking powder in a large bowl. Once the butter-sugar is the right texture slowly mix this dry mixture into the butter-sugar, alternating with an egg, until all the dry mix and eggs are in the batter. Beat in the orange zest. 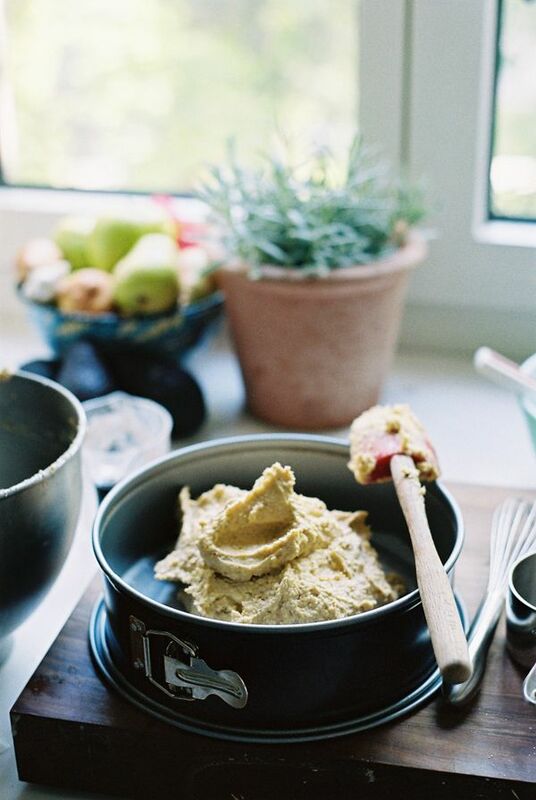 Spoon and scrape the batter into your spring form pan, smoothing the top with a rubber spatula. Bake for about 40 minutes or until a cake tester comes out cleanish and the edges of the cake have started to shrink away from the sides of the pan. Using a needle or narrow cake tester, poke the cake all over, from the center out to the edges. While the cake is cooling make the rhubarb compote. Preheat the oven to 400ºF / 200ºC. 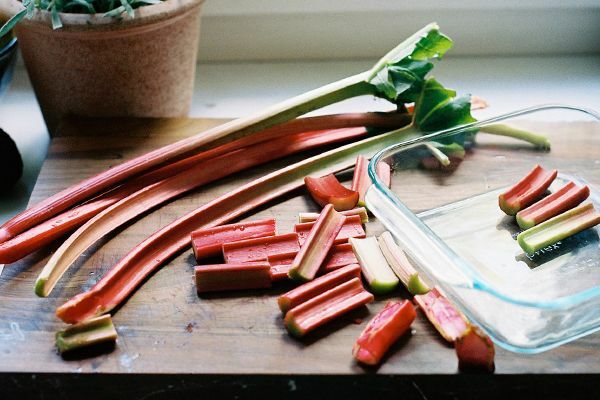 Rinse the rhubarb and cut off and discard any leaves. Slice the stalks into 2-3 inch lengths and place in an oven safe dish. Remove the peel from 2 oranges, cutting away any white pith, then slice the oranges and tuck them in amongst the rhubarb. Squeeze the juice from the two remaining oranges over the rhubarb. Sweeten with one heaping tablespoon of sugar - or a bit more if your rhubarb is very tart. Add the vanilla pod, pressing it between the rhubarb. Cover the dish with foil and bake until the rhubarb is tender enough to crush with a fork, about 30 minutes. Strain the juices out of the dish. Pour over the polenta cake, making sure to cover the entire surface, not just the center. 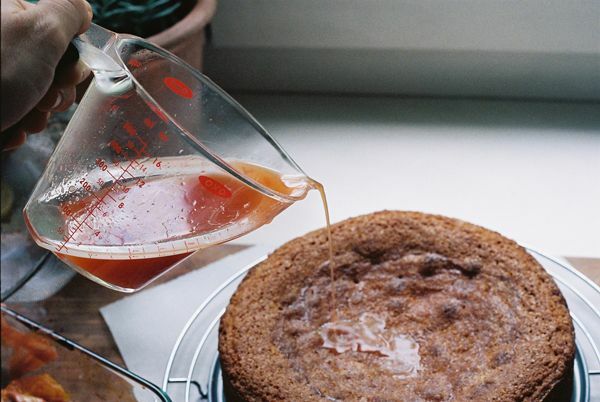 You will not be able to use all the juice, but add as much as you think the cake can comfortably absorb and pour the rest back into the rhubarb-orange mix. 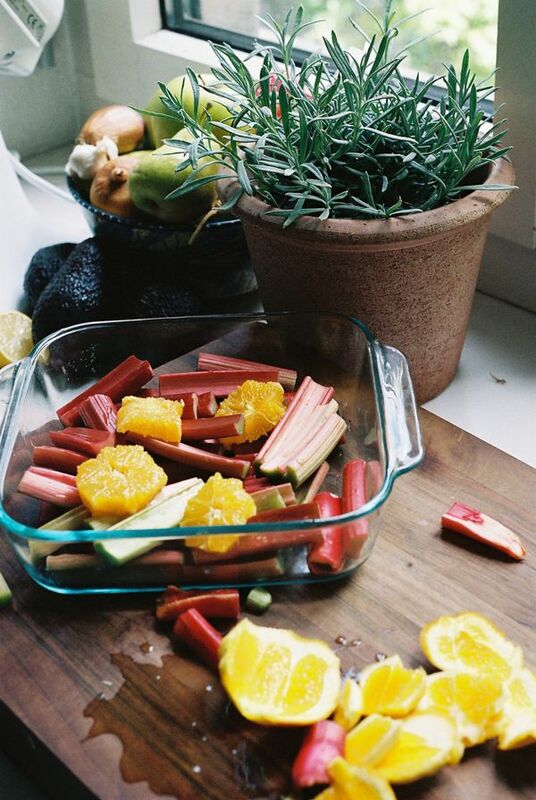 Serve the baked rhubarb along side the cake. If you didn't realize, this cake is gluten free. I've taken up the habit of marking gluten free recipes and hoarding them until our friend Jess comes to dinner. It's good to have gluten free friends, they introduce you to wonderful foods like polenta and quinoa and macaroons. 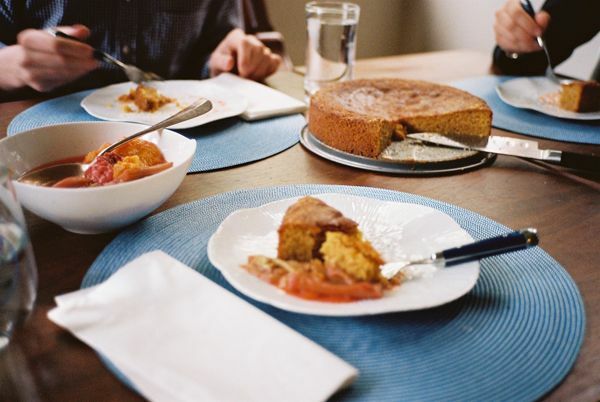 Find yourself a gluten free friend (it shouldn't be hard these days, seems to be the new wave), and make them rhubarb-polenta cake for dessert. It also doubles as a wonderful breakfast cake. I know, I ate it for breakfast three days last week. It also makes a great snack cake, I know that too, because I ate slivers of it every afternoon. All this cake will inspire you to go for a walk, a long walk so you can come back hungry for more cake. I love custardy things. You've made this cake sound irresistible, Talley. I'm supposed to have some friends over tomorrow for dinner (their kitchen is in the midst of serious renovation), and I've been fretting about what to make for dessert (and for dinner too). I think this settles it, so long as I can find some nice rhubarb by tomorrow afternoon. You mean you're not making a Milk bar cake for your dinner guests? Hopefully they aren't avid followers of your blog otherwise I'm sure they will be disappointed by the lack of layers in this cake. That said, it's simple and tasty and will leave them thinking that maybe they should bake a bit more often. And why is it always so hard to decide what to make for friends? Somehow I make dinner every night without much fuss, but when it comes to having guests over I always freak out, and make a gazillion lists, and then always end up making a roast chicken. Let me know what you make, I'm curious. And remember - they don't care what you make, they are just happy to be out of their kitchen and at your table! You do love custardy things! I need to embrace custard a bit more. Zach just informed me that he loves lemon desserts (who knew?) so I think it's time to try out some lemon custards. Hopefully, when I am done with writing class papers forever (next Friday! ), I'll still be able to find some rhubarb and put it together! I made individual coconut flans for dessert, which I hope to write about soon, and ran off to class, leaving Octavian to make dinner. He did splendidly: amazing saffron risotto plus sausages with thyme and garlic. It was all from a new cookbook we got a couple of days ago. I promise to divulge more when I'm done writing this last paper. First I have to say I love that last picture. It is pictures like that one that make me want to go live in switzerland. 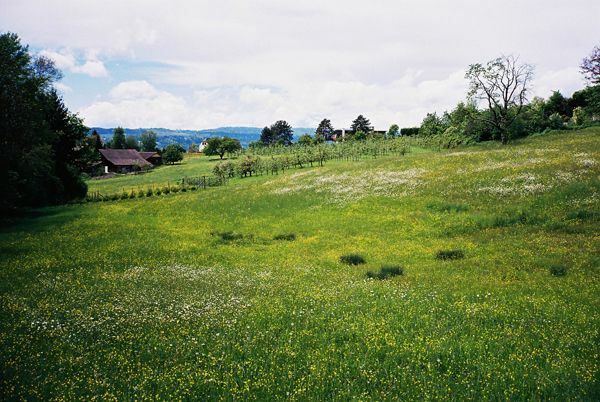 I still remember last year being shocked when my flight landed in zurich-- there weren't stretches of concrete or pavement or boxy pale buildings, there were just little houses and green grass everywhere. So beautiful. Anyway! I loved reading this post. I have a friend living in Berlin, and he says that every time he tries speaking german, whoever he is talking to simply responds in English because they find that easier than trying to figure out what my american friend is trying to say. But of course, as you mention, when asked if they speak english they always say "a little bit." Ha! Oh if only I could speak "a little" french, german, italian and spanish... I think then I'd be set. And I've been seeing some polenta-almond cakes pop up around the internet. I am so curious to try one now! I loved that you paired it with a rhubarb compote, in beautiful matrimony. ;) The combination really does look lovely. Amy - yes, the color green definitely comes to mind when I think of Switzerland. It is SO green, and the grass is SO perfect. And all the little wooden farm houses scattered through the countryside are SO picturesque. All those SO's are what make me super thankful to be living here right now. Whenever I'm feeling down or in doubt about our expat life I head the the mountains for a dose of greenery & scenery. Thanks for relaying the story about your friend in Berlin. It's great to hear that actually, makes me feel a bit better. I've convinced myself that if I lived in Berlin I'd be fluent by now, because I'd be surrounded by high German, not this silly Swiss German, but it's true, that wherever you go people want to practice their English more than they want to listen to your bad German. And yes, they really do speak *a lot* of about 4-5 languages, which makes me feel a quiet pathetic. I was worried people might be sick of Rhubarb, but it will be gone soon enough, along with asparagus (which I don't really like) so we might as well surround ourselves with it while we can! Katharina - Thank you for your comment. Funny enough I just learned 'lecker' this morning in my German class and it's already my new favorite word. Lecker - almost sounds like the noise you make when you lick a lollipop. Loved seeing that Coop has recipes, I didn't know that. And yes, a perfect way to practice my German baking vocabulary. Funny enough I've been thinking about making a souffle. I had been thinking I'd make a lemon one, but perhaps I'll try rhubarb before it's too late and there's no more rhubarb in the market. I love the idea of watching a German cooking show, and that show sounds right up my alley, I can't wait to watch it - perhaps tonight. And thank you for the -ei/ie fix. Eek. I still mix that up in English so it's bound to be a slow road with German and all the ie/ei words, and of course it gets even more confusing as some of them switch in different tenses. It seems that everyone living in non-English speaking countries speaks English better than hardly any English-speaking foreigners speak their language. It can be frustrating. Are Americans just that bad at language?? 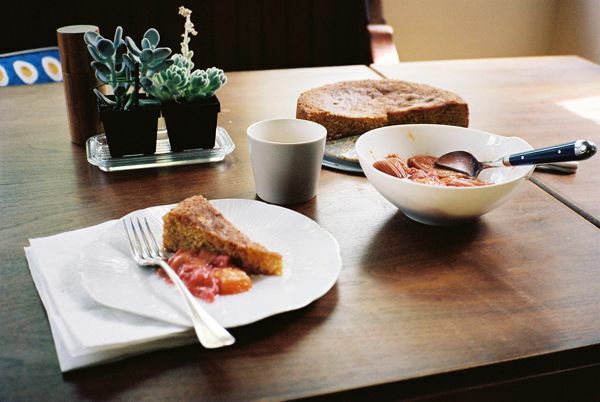 I also made a rhubarb-polenta cake last week - lovely combination. The compote looks delicious! I think Americans are at a huge disadvantage because we aren't forced to learn multiple languages from an early age and because we aren't surrounded by different languages on a daily basis. The Swiss are confronted daily with German, Swiss German, English and French, and sometimes Italian. It seems like most Swiss I meet speak at least three languages. It's amazing, and makes me feel useless. The 10+ years of Spanish that I took are of no good to me here, or really anywhere considering how much I've let it slip. Your polenta cake looks lovely! I saw a similar one in Tender. I will have to put Ripe on my cookbook-want-list. Thanks for your comment. Das Rezept sieht wirklich lecker aus! Ich will es bald mal probieren, denn ich liebe Rhabarber. Und deinen Block, den liebe ich auch! Actually many Americans and Brits have told me about the same "problem" with Germans: that "ein bisschen" means a lot. My best friend's mom is American and after 24 years in Germany she still is much more comfortable when she can listen to someone like my "Mama", who had no feeling for English in her entire life (really, it's not pretty), than speaking German herself. What really helped me become better in my foreign languages was buying children's books or books that I already knew from the heart. Annelle, Thank you for your comment. I must admit that I had to use my dictionary to translate the first bit. I'm getting better, but not quiet there yet. I got the "ich liebe Rhabarber" though :) Reading children's books is a a great idea and I wonder if they dub Grey's Anatomy (meine Lieblings-show) in German. And I'm glad to hear that I'm not the only one who thinks that the definition of "ein bisschen" should be changed from 'a little' to 'a lot'. Yes, of course, Grey's Anatomy runs on Pro7 every wednesday at 8:15 pm. haha! yes it's definitely true that it's hard to tell when Germans are talking are arguing, it all sounds so harsh and official. I'm impressed that you are doing your apprenticeship under a German chef. Are you doing it in Germany? Is the kitchen run entirely in German? If so, wow! I keep thinking I'd love to get a simple apprenticeship in a bakery here in Switzerland, but I'm scared off of even trying by the language barrier, but maybe I should give it a try, nothing to lose. Thanks for your comment, and good luck finishing up! Love the matchmaker analogy! I'm a fan of cakes soaked in syrup, and this one looks lovely! Talley, I love this post! I remember trying to buy things at the market in Chile using my (not-so-great) Spanish and wondering what I might actually be offering to pay and/or buy. And the image of your apartment covered with color-coded post-its is hilarious. I was bequeathed some rhubarb from a friend and I'll give this a try when we return from Berlin! Such beautiful light in these photos!